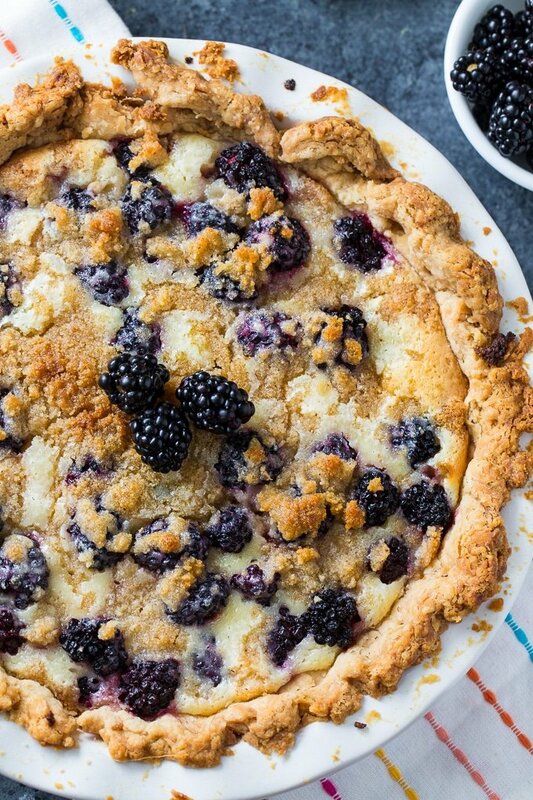 Blackberry Cream Pie is a fabulously sweet and tart summer pie in a flaky pie crust. It is wonderful served cold, warm, or at room temperature and is a delicious way to turn summer fresh blackberries into a dessert. This homemade pie is absolutely full of fresh fruit. I didn’t like them much as a child, but as an adult, I adore fruit pies. This Blueberry Buttermilk Pie is one of my favorites. 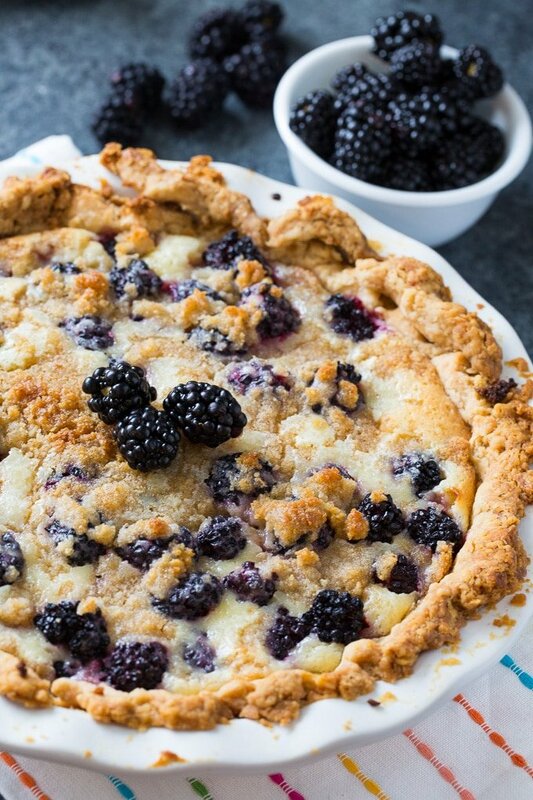 Blackberries, because they are so juicy and tart, make wonderful fruit pies. In addition to the tartness from the blackberries, you also get a little tartness from the sour cream that is added to the filling. But there is plenty of sugar to balance the tartness. My favorite part of this pie is the sugar/butter/breadcrumb mixture that gets sprinkled on top. It tastes divine. The pie crust is a super flaky one made from shortening. But if you prefer a butter pie crust, you can make one of those instead. Or use a refrigerated pie crust if you don’t have the time to make a homemade one. 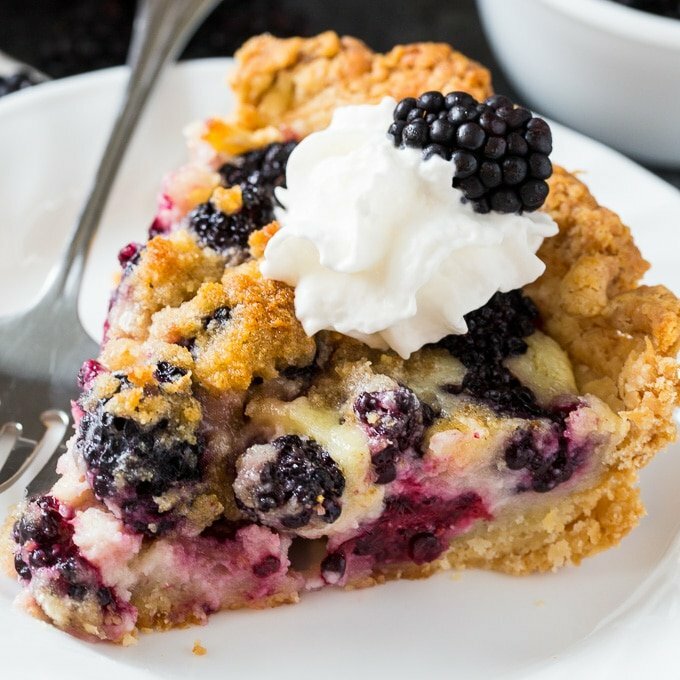 Blackberry Cream Pie is a fabulously sweet and tart summer pie in a flaky pie crust. It is wonderful served cold, warm, or at room temperature and is a delicious way to turn summer fresh blackberries into a dessert. Make pie crust. Whisk flour and salt in a large bowl. Use a knife to cut shortening into chunks. Add to flour mixture and cut it in with a pastry blender or your fingers until there are no pieces larger than a pea. Whisk together egg, vinegar, and 4 tablespoons of water in a small bowl. Add to flour and stir with a fork until a dough forms. Add another tablespoon of water, but only if dough will not hold together when you pick it up and squeeze it in your hands. Divide dough into 2 pieces and shape into discs. Wrap in plastic wrap and refrigerate for 60 minutes to 24 hours. Preheat oven to 375 degrees. On a lightly floured surface roll 1 piece of dough out to fit a 9-inch pie plate. Shape dough to fit pie plate, folding edges over and crimping the edges. Prick bottom and sides with a fork. 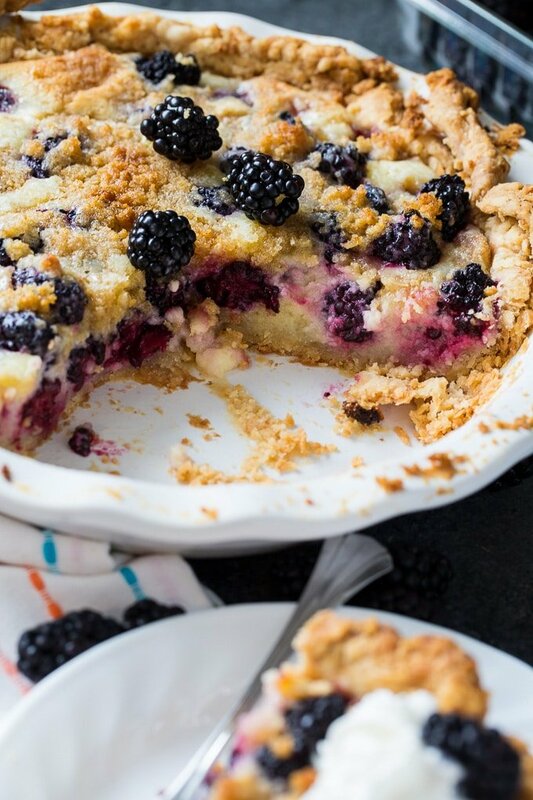 Place blackberries in pie crust. In a medium bowl, whisk together sour cream, 1 cup sugar, flour, salt, and egg. Pour mixtuer over blackberries. Place butter and 2 tablespoons sugar in a small microwave safe bowl. Microwave on HIGH for 30 seconds. Stir to dissolve sugar. Stir in breadcrumbs and sprinkle mixture over pie. Bake for 45 minutes or until filling is set. Let cool completely before slicing. This entry was posted in Pies and Tarts and tagged blackberries. Bookmark the permalink. I also noticed that she did not give the directions for blind baking the crust. I am going to try this w/ blind baking the crust with pie weights. Hello I read the recipe several times. I did not see where you roll out the second crust. This pie does or does not have a top crust ?